Inflating airbags can cause serious harm or death. The damage occurs when the passenger’s head is struck by the airbag, which can travel at speeds up to 200 mph, before it has fully inflated. A vehicle’s “occupant protection system” (OPS) consists of airbags, belt/shoulder restraints, and seat tracks. 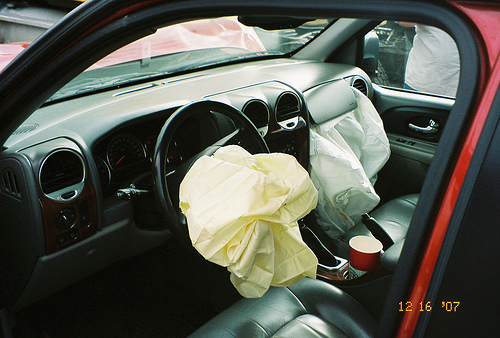 If the system is designed properly, occupants should not be harmed by deploying airbags. Instead of the head being struck by the airbag during deployment, the head should be cushioned by the fully deployed airbag. Two entirely different dynamics… and often the difference between life and death. When a vehicle strikes an object, the human body continues to move forward at the pre-crash speed of the vehicle until it is restrained by a seatbelt/shoulder harness or comes into contact with the airbag, windshield, or instrument panel. The one factor common to all persons severely injured or killed by an airbag is that they are very close to the airbag at the time of deployment. A properly designed system prevents this from happening. Seat tracking determines how far forward seats are able to be situated. If located too close to the airbag, the inflating airbag will impact the head before it has fully deployed. The solution to this problem is for manufacturers to limit how far forward seats can move on the track. When designing this aspect of the OPS, manufacturers must assume that the occupants will have their seats fully forward. The other consideration to prevent occupants from being too close to airbags during deployment, is the seatbelt/shoulder harness system. Shoulder harness pre-tensioning should limit the body from moving forward into the deployment zone. Manufacturer warnings about positioning the seat too far forward should also be given. At the very least, the warning should be given in the Owner’s Manual, but it should also be given verbally when the vehicle is started and through a dashboard display. The danger is too great to avoid instituting these relatively inexpensive measures. The consequences of being too close to a deploying airbag are well known. Despite signficant kicking, biting, and screaming, for the most part manufacturers have been forced through lawsuits to take reasonable steps to prevent this dangerous condition. A manufacturer that fails to take this danger into consideration can and should be held accountable. Sadly, some auto makers continue to manufacture vehicles without regard to the danger. If you or a loved one are harmed by a defectively designed motor vehicle or other type of product, contact our office at 866-785-GALE or by email to learn your rights. We handle defective design cases on a contingency basis, which means that we charge no fees or costs until we win your case.